The Learning Link is a no cost, hands on learning opportunity for parents and children ages 2 ½ - 5 years old that features daily activities to support and encourage healthy growth and development. The Learning Link offers both parent and child an opportunity to participate in fun educational activities, referrals to community resources and provide health and developmental screenings at no cost to parents. For more information, please visit: Learning Link FAQ. How do I register my child for Learning Link? To register for the Learning Link, please complete the Learning Link Online Registration Form. Once you've completed this online form, the department will send you the Learning Link Registration Packet. Does the program have eligibility criteria? 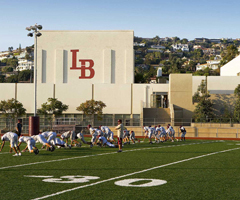 The program serves children and families who live in Laguna Beach or their child attends a preschool within the boundaries of the Laguna Beach Unified School District. What forms do I need to refer a child to the School Readiness program? All forms can be found in the Parent section of the Forms page under 'School Readiness'. What is the best way to find out more information about the School Readiness program and Learning Link? To receive more information about the School Readiness Program and the Laguna Beach Unified School District's Learning Link, please email Sandee Bandettini, Early Learning Specialist at sbandettini@lbusd.org.